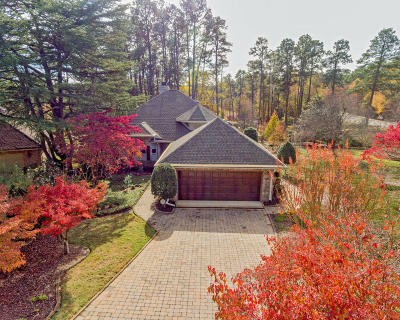 Gorgeous GOLF & WATERFRONT single level brick home in Longleaf CC on beautifully lanscapped double lot. Impeccably maintained and updated home with over $100,000 in upgrades including granite counter tops, custom cabinetry, hardwood floors, custom window treatments, generator, irrigation, central vacuum, security system new deck, walks and brick paved drive and walkways. Extensive landscape design with lush gardens enhance the outdoor living. Owner maintains easement behind lot. Large entry opens to living room with fireplace and built-ins plus formal dining area. Kitchen has been completely renovated with custom cabinets and granite and has island plus large eating breakfast area. Two insulated climate controlled Carolina rooms enter from living and dining room for extended living space.